The guide finds the best bike headlight for night riding. Enjoy. What's better than riding your bike all day long? Having the ability to ride it at night as well! Gone are the days when our riding has to come to an end with the setting of the sun. With the invention of high-powered, portable luminosity we can ride anytime, we feel the need and in confidence that we can see as clearly as if it were daytime. Bike lights are readily available in many options that include battery backups, rechargeable units, water-resistance and come with all the mounting hardware necessary to affix them to our bike. If you're in a rush the Vision II takes the top spot. It's incredibly bright and comes with a USB charger. Perfect! So what is a “lumen”? Lumens are a measurement of total light output and are not to be confused with brightness. Lumens are certainly part of the equation, but other things play into brightness, such as “beam pattern” which we will learn about as well. The beam affects how bright a light appears, as well as how far the light reaches and how much spread you have. 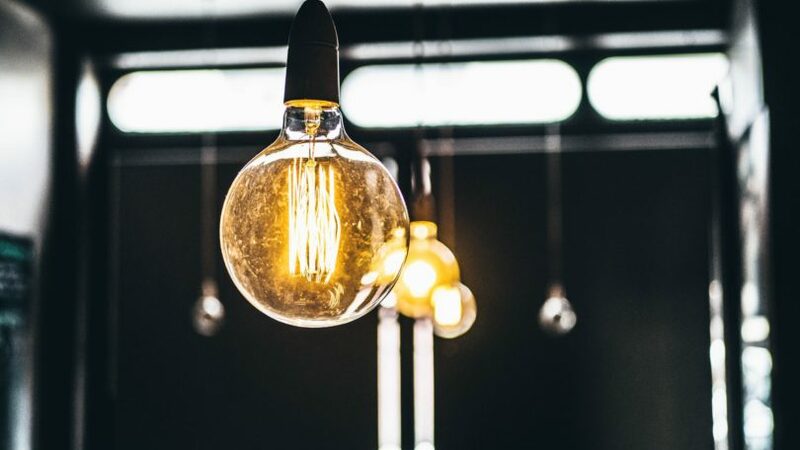 When choosing which light is right for you will want to consider if you prefer a directional beam or do you want one with more spread to light up things in your periphery as well? Riding on a straight road is altogether different than riding on a winding path or trail. Think about riding a winding trail. When you are riding, your focal point tends to be about ten feet in front of you, more or less in a straight path. But, your bike is not going in a straight path, your handlebar is turning left and right, and with it…your light. This is where having a wider beam comes into play. It helps you to see not only what is directly ahead of you, but the path coming up. You may find that wearing a second light on your helmet can help compensate for this better. 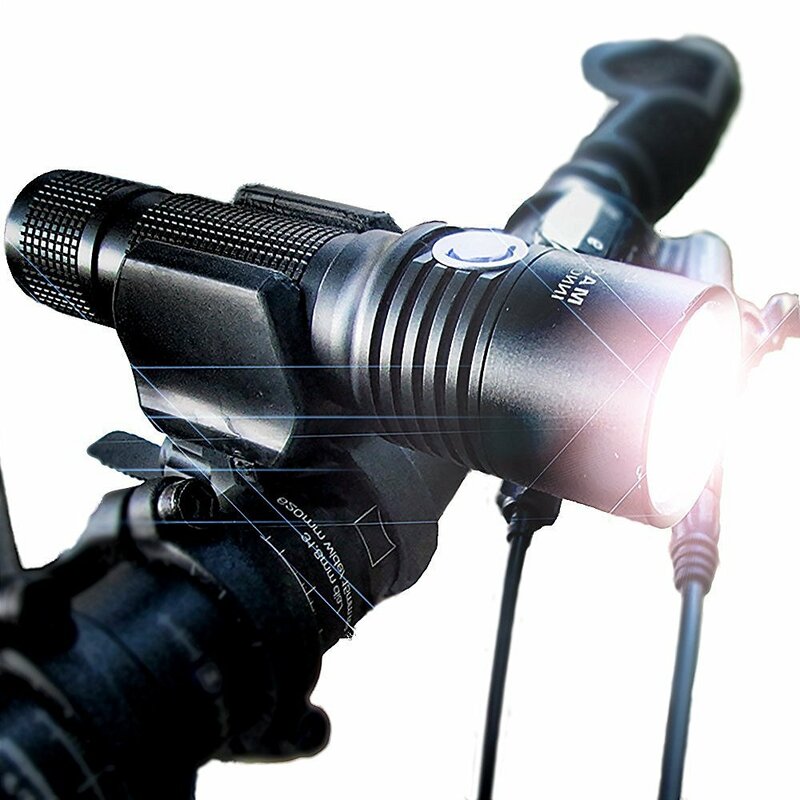 Probably the most important feature of your bike light is how long it'll last. You might have the brightest light in town, but if it only lasts half of your ride… well, that’s not very helpful. Especially if you have a long commute​. Can you recharge the batteries or do you have to replace them? If you have to replace them, how much do replacement batteries cost? Are they easy to purchase? If they are rechargeable batteries, what kind of plug does it require? Can you plug it into your computer or car via a USB port or do you need a wall socket? Are the batteries contained in the light itself or does it come with a battery pack that you affix to your bike? How long will your light work on one charge? And is this charge time based on full-strength or a lesser brightness? Nowadays we are lucky enough to have long-life batteries and charging via a USB port or portable charging units that we can attach to our bike. It's important to decide what kind of material you want your light made out of. Obviously, some lights are going to be heavier than others, but this is probably due more to the batteries than the housing. Some lights are solid metal, and some incorporate plastic parts as well. All bicycle-specific lights are going to come with a mounting of some sort. Mountings range from simplistic silicone straps to clip-on mounts of plastic. Most mounts will fit standard handlebars. But if you have a custom set of handlebars or something that is a little unusual it's better to check the fit first. Most lights offer multiple settings. The Magnus Innovation Vision II 860 will charge in under 4 hours and has an indicator light to let you know it is fully charged. The housing is waterproof allowing you to ride in confidence in wet weather. The lumen output ranges from 860 on high, 400 on medium and 180 on low. Output is around 90 lumens on the strobe setting. This light runs on a USB rechargeable Li-Ion battery, but you can also substitute regular AAA battery. This light allows you to change the beam pattern as well, so you can narrow or widen it at your discretion. The light pops into a plastic clamp which is affixed to the bike with a silicone strap. The Xtreme Bright ﻿Ligh﻿t is a LED headlight and taillight combo pack. 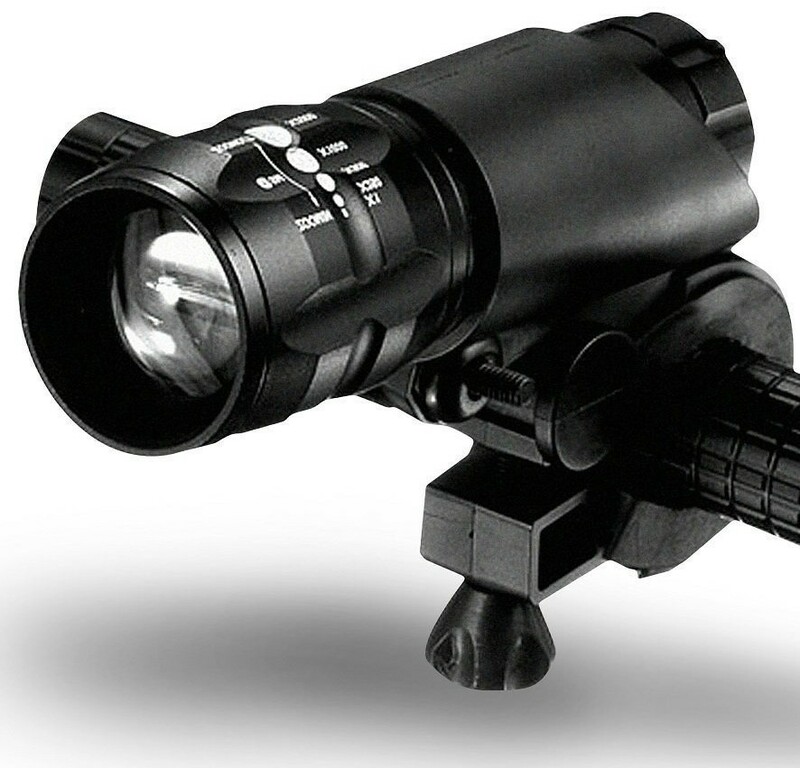 The headlight boasts 500 feet of visibility with 300-lumen output. It's waterproof, made of military-grade aluminum and affixes to your bike with a plastic bracket and allows for easy removal of the light. Three AAA batteries power it. The rear back light runs off of three triple AAA lights. 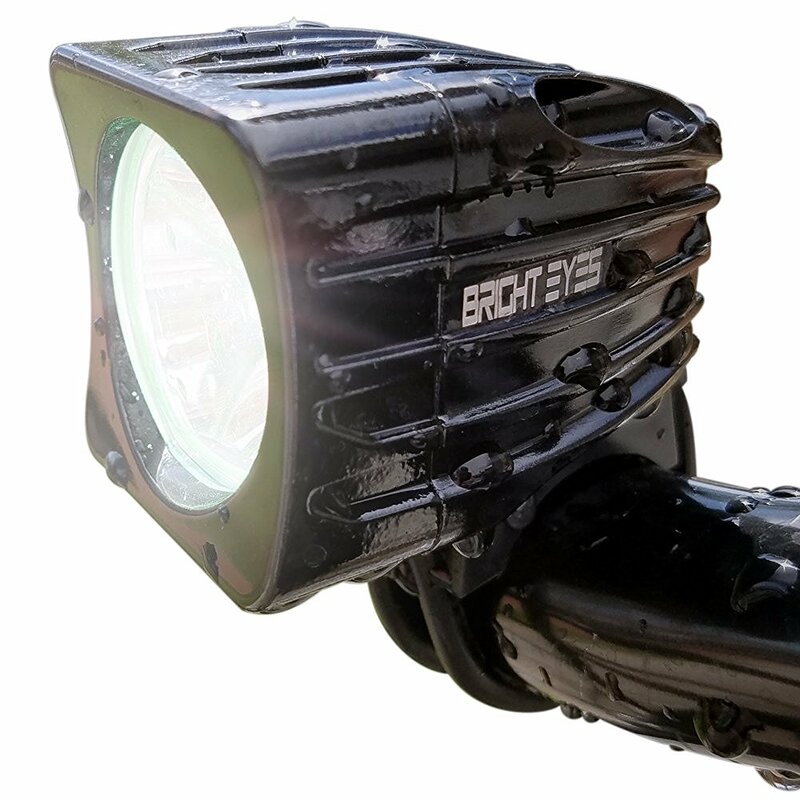 The Bright Eyes Mountain B﻿ike Ligh﻿﻿t is also a multi-pack including a rear light, mounting hardware, and a secondary mount. The secondary mount comes with elastic straps so that you can also wear the unit on your helmet. A 6400mAh battery powers the light in a separate case that is affixed to your bike as well. It is stated to have an output of 1200 lumens. The beam has three settings allowing 3 ½ hours on high, 6 hours on medium, and 24 hours of light on low. It also comes with a diffuser ring that lets you increase the spread of the light beam. Our top choice is the Vision II. With its 860 lumens of output, it provides plenty of light for a safe and secure ride. Also, it's simply more portable and easier to deal with because you don’t have to worry about attaching a battery pack to your bike. This makes it lighter because there are fewer things you need to keep track of. The built-in USB Charger makes it super easy to recharge via your computer or car, so you can charge easily anywhere you may be. With its robust construction and waterproof housing, it's sure to last a long time allowing you many night rides in any weather.